A master's degree in accounting will prepare you for a range of rewarding and well-paying careers. Degree holders often find work in accounting, financial management, business management, or in managerial positions in human resource departments. While a bachelor's degree in accounting is adequate preparation for some careers in the field, many states require aspiring certified public accountant's (CPA's) to hold a master's degree. Regardless of what you want to do with your degree though, having a master's will separate you from job candidates without a graduate credential. The curriculum for an online accounting master's degree program covers fundamental financial topics, like auditing and budget analysis, while also introducing advanced and specialized concepts. Courses may address nonprofit and government accounting. Graduate programs culminate in a research-based thesis project or presentation. Students may also be required to complete an internship or work-study component. Some master's programs encourage learners to choose a concentration, allowing students to shape the curriculum according to their career and academic goals. A forensic accounting concentration emphasizes fraud investigation techniques and legal procedure, while a nonprofit accounting specialization focuses on the financial needs of tax-exempt entities. Other common concentrations include portfolio management, taxation, and personal finance. Selecting a master's degree specialization is often the first step in finding a career that suits your interests. University of Illinois at Urbana-Champaign ranks #1 on The 30 Best Online Master's in Accounting Programs! Founded in 1867, Illinois is known for its pioneering research and top-ranked teaching. The school's virtual arm, Illinois Online, offers more than 75 degree and certificate programs. Illinois' master of science in accountancy program is ideal for students interested in earning an advanced degree in accounting. This completely-online program, delivered in partnership with the learning platform Coursera, requires students to complete 32 credits and finish the program within 36 months. This program emphasizes hands-on practice, and students develop a mastery of analytics and build accounting expertise in several areas, such as financial reporting, taxation, and audit and control. Courses in this master's in accounting online program cover auditing, accounting analysis, managerial accounting, and federal taxation. Learners can also choose from a number of electives, such as data analytics and statistical analyses in accountancy. Faculty deliver MSA courses in an eight-week format. Illinois offers program start dates in August and January. Learners who start in August can earn their degree in 18 months, while those who start in January can finish in 24 months. Illinois boasts more partners in Big-Four certified-public-accountant firms and CFOs in top Fortune 500 corporations than any other college. Admission to the program requires a bachelor's degree in any discipline with a minimum 3.0 GPA, some business background, and GMAT or GRE scores. Illinois is regionally accredited from the Higher Learning Commission (HLC). University of North Carolina at Chapel Hill ranks #2 on The 30 Best Online Master's in Accounting Programs! The University of North Carolina at Chapel Hill hosts scholars, researchers, and entrepreneurs. Programs at the business school prepare ethical business leaders through a combination of lectures, project-based learning, and hands-on simulations. Students who choose the online version of the school's master of accounting degree complete 33-48 credits, depending on their previous academic experience. Individuals take synchronous evening courses through a virtual classroom. Coursework in the online master's in accounting program includes financial reporting, federal income tax, managerial and cost accounting, and data analytics for accountants. Electives cover topics such as economics, financial statement analysis, and governmental accounting. Learners choose one of two concentrations: taxation or auditing. In addition to live classes and discussion, students engage in group work with peers. Students interested in learning abroad and doing business in a global context can pursue a global immersion experience where they learn about trading regulations, tax treaties, and supply-chain implications. Students typically complete the program in 12-36 months. UNC offers start dates in January, March, June, and September. Admission into this program requires a bachelor's degree with a minimum 2.8 GPA and GRE or GMAT scores. UNC Chapel Hill is regionally accredited from the Southern Association of Colleges and Schools Commission on Colleges (SACSCOC). University of Missouri ranks #3 on The 30 Best Online Master's in Accounting Programs! The University of Missouri is the state's flagship college. Mizzou enrolls approximately 30,000 students in more than 300 academic programs. The university's college of business administers one of the top online accounting master's degrees in the nation. The online master of accountancy does not have any on-campus requirements. This fully-online program requires students to earn 30 credits, including two core courses in auditing theory and strategic analysis. Learners must also take nine credits in business courses, examining areas such as operations management, organizational behavior, and the legal aspects of business organization and operation. Elective courses fulfill the remaining credit requirements, developing students' skills in tax research, accounting ethics, governmental accounting and budgeting, and taxation of corporations and shareholders. Individuals typically complete the program in one to three years. Distance learners at Mizzou have access to the same networking opportunities as their on-campus peers. The school's career services department helps students find internships and full-time jobs. Graduates pass the CPA exam at rates that exceed the national average and enjoy a 95% job placement rate. Online learners pay the same tuition, regardless of their state of residency. Admission into this program requires a bachelor's degree with a competitive GPA, prerequisite coursework in accounting, and GRE or GMAT scores. Mizzou is regionally accredited from the High Learning Commission (HLC). The online MAcc program is accredited by the Association to Advance Collegiate Schools of Business (AACSB). University of Saint Francis ranks #4 on The 30 Best Online Master's in Accounting Programs! USF, a Catholic institution, offers many programs that are steeped in the school's Franciscan values. More than half of the university's 4,100 learners enroll as graduate students, many of whom take courses online. USF administers a master of business administration program with several specializations, including accounting. The 36-credit MBA with an accounting concentration emphasizes analytical thinking, leadership, decision making, and an understanding of global and competitive challenges. The MBA core curriculum delves into managerial economics, managerial finance and accounting, and an experiential learning project. Students use 12 credits to develop competencies in a number of areas, such as marketing management, international business, applied business research models, and human resource management. The accounting concentration covers the conceptual and technical competencies of the field, focusing on taxation, fraud examination, financial statement analysis, and international accounting and reporting. The curriculum also fosters leadership development to facilitate career advancement, whether students plan to work in private organizations, public accounting, or nonprofits. Extracurricular activities include membership in Delta Mu Delta, an international honor society open to qualifying MBA students. Learners can complete the program in 12-18 months. The program has start dates in the fall, spring, and summer terms. Admission into the MBA program requires a bachelor's degree and a minimum 2.75 GPA; some students may also be asked to submit their GMAT scores. USF is regionally accredited from the High Learning Commission (HLC). The online master's in accounting program is accredited by the Accreditation Council for Business Schools and Programs (ACBSP). University of Connecticut ranks #5 on The 30 Best Online Master's in Accounting Programs! UConn attracts talented students from around the world. The school operates a main campus in Storrs, four regional campuses across the state, and an online platform. Among the school's many online degrees is its 30-credit master of science in accounting, which is an asynchronous program. The MSA in accounting provides students with flexibility; enrollees have the option to design their own curriculum. Learners receive most instruction through virtual classrooms, which facilitate interaction between students and faculty. Students take a required course that covers the responsibilities of accounting professionals and choose between coursework in taxation of business entities, issues in financial reporting and analysis, or contemporary managerial accounting issues. Students completing their master's in accounting online can further tailor their degrees by picking from electives such as taxation and business strategy, evaluating internal controls, taxation of business entities, and global financial reporting and analysis. Learners must also participate in one four-day residency on the university's main campus. Full-time students can complete the program in 8-18 months, while part-timers have the flexibility to take much longer if they need to. Admission into this program requires a bachelor's degree, MSA-related prerequisites, and GMAT scores. UConn is regionally accredited from the New England Association of Schools and College (NEASC). The online MSA program is accredited by the Association to Advance Collegiate Schools of Business (AACSB). Syracuse University ranks #6 on The 30 Best Online Master's in Accounting Programs! Located in Upstate New York, Syracuse offers 200 programs, including a master of science in professional accounting, which covers auditing and tax processes. The program is designed to prepare graduates to sit for the CPA exam and enrolls learners with a background in accounting and those with undergraduate degrees in other disciplines. Individuals entering the program with an accounting degree must complete 30 credits, which they can earn in 12 months. Students without an accounting degree must earn 33-48 credits, depending on their previous coursework, and can finish in two years. The four-course core of this online accounting master's degree program covers advanced auditing, financial statement analysis, taxes and business strategy, and international reporting and analysis. Learners also take two courses in management, studying areas such as financial modeling, fraud examination, and/or linear statistical models. Students complete the remainder of their credit requirements by taking electives that are related to their professional and personal goals. Students can become members of professional organizations and participate in seminars and networking events. The business school has relationships with recruiters from many accounting firms, including Deloitte, KPMG, and Ernst & Young. Online learners pay the same tuition, regardless of their residency status. Admission requires a bachelor's degree, school transcripts, and GRE or GMAT scores. Syracuse is regionally accredited from the Middle States Commission on Higher Education (MSCHE). University of Arizona ranks #7 on The 30 Best Online Master's in Accounting Programs! Arizona excels in many fields, including space sciences, the arts and humanities, and business. The university's distance branch, UA Online, delivers more than 80 fully-online programs. Among these is the school's 30-credit online master of science in accounting, which accommodates students with diverse academic backgrounds. The MSA program teaches learners the technical competencies required for CPA licensure. The curriculum is divided into 18 credits of required courses and a selection MBA and accounting electives. Once students complete prerequisites at UA or another institution, they take MSA core courses in areas that include auditing principles, business law, advanced financial accounting, and accounting theories and institutions. While the duration of the program varies, full-time students generally complete the curriculum in 12 months. Learners pursuing CPA licensure take courses that meet licensure requirements for Arizona, California, or Texas. Students who sit for the CPA test within one year of graduation perform above the national average with a 70% pass rate on their first attempt. Faculty deliver the master's in accounting online program using eight-week courses. Students can begin classes at one of six start dates in the fall, spring, and summer. Admission requirements include a bachelor's degree with a minimum 3.0 GPA and GRE scores. Arizona is regionally accredited from the Higher Learning Commission (HLC). The MSA program is accredited by the Association to Advance Collegiate Schools of Business (AACSB). University of Oklahoma - Norman ranks #8 on The 30 Best Online Master's in Accounting Programs! Founded in 1890, the University of Oklahoma enrolls more than 20,000 students through three in-state campuses. UO's comprehensive suite of programs include a growing list of eLearning options. The school's college of business offers an online curriculum that prepares learners for the CPA exam. The 30-credit master of accountancy is delivered asynchronously and helps students develop advanced accounting competencies. Students delve into topics related to income tax accounting, financial statement analysis, and accounting ethics and professional responsibilities. Learners also examine subjects covered in the MBA program, such as corporate finance, negotiation and leadership, and organizational behavior. An international study abroad component gives students the opportunity to engage in an optional two-week, three-credit module in international financial statement analysis. The module exposes learners to accounting and introduces them to business professionals in Paris, London, and Brussels. Students acquire knowledge about accounting and business in an international context as well as the standards for global reporting. Students can enroll in the spring, summer, or fall and typically earn their diplomas in fewer than two years. The curriculum provides the requisite 150 hours of college credit for CPA licensure in Oklahoma, and its students have a first-time pass rate of 74%. Learners in the online program pay the same tuition, regardless of their state of residency. Applicants must have an undergraduate accounting degree from a school accredited by the AACSB and submit their school transcripts; some students may be asked for their GRE or GMAT scores. Oklahoma is regionally accredited from the Higher Learning Commission (HLC). University of Massachusetts - Lowell ranks #9 on The 30 Best Online Master's in Accounting Programs! UMass-Lowell, a national research college, administers more than 40 master's programs that emphasize experiential learning. The school also offers one of the largest selections of eLearning options in New England, including a 30-credit master of science in accounting program. Students complete MSA coursework entirely online and can enroll part time for greater flexibility. Learners must take five core courses in advanced auditing, advanced cost management, taxation of business entities, government and nonprofit accounting, and financial accounting theory and research. Students pursuing their master's degree in accounting online also take electives in areas such as globalization and accounting, contemporary accounting issues, and fraud examination and forensic accounting. A course on advanced management and sustainability accounting examines how accountants can use value-chain activities to develop an organization's sustainability plan. UMass-Lowell provides support services that include tutoring and continuous tech support. Learners in the online MSA program pay one tuition rate, regardless of their residency status. Admission requirements include a bachelor's degree, school transcripts, and GMAT scores. Students without a bachelor's degree in accounting must take some prerequisite accounting courses. UMass-Lowell is regionally accredited from the New England Association of Schools and Colleges (NEASC). The online MSA program is fully accredited by the Association to Advance Collegiate Schools of Business (AACSB). University of Massachusetts - Amherst ranks #10 on The 30 Best Online Master's in Accounting Programs! UMass-Amherst provides learners across the country and around the globe with the opportunity to learn virtually through its University Without Walls program. The school of management administers business programs that emphasize change agency, data-driven decision making, and the entrepreneurial spirit. Additionally, the business school offers several degrees online, including a 30-credit master of science in accounting. Learners cover a curriculum that delves into the tax implications of business decisions, financial valuation, and professional skills such as business writing and public speaking. This master's in accounting online program also fulfils the education requirements necessary for CPA certification. Specific areas of study include advanced auditing, fraud investigation, and financial statement analysis and valuation. Additionally, a notable course on white collar investigations examines the federal laws relevant to accountants and publicly traded companies. Graduates enjoy high placement rates due to the school's strong relationship with top accounting recruiters.The program enrolls students with undergraduate degrees in accounting and other disciplines. However, learners without an accounting degree must complete certain MSA entry requirements. The program begins in the fall, spring, and summer. Admission requirements include a bachelor's degree and GMAT scores. UMass-Amherst is regionally accredited from the New England Association of Schools and Colleges (NEASC). The online MSA program is fully accredited by the Association to Advance Collegiate Schools of Business (AACSB). University of Miami ranks #11 on The 30 Best Online Master's in Accounting Programs! Established in 1925, Miami serves approximately 11,000 learners in the South Florida region and beyond. The college administers more than 180 majors through 11 schools and colleges and offers many online options. The university's 32-40-credit master of professional accounting program enrolls students with accounting and non-accounting undergraduate degrees. This accelerated program fulfills the educational requirements necessary for CPA certification but also offers a non-CPA track for individuals without an accounting background. Students take 8-10 courses, depending on their chosen track. Areas of study include taxation, advanced accounting and financial reporting, accounting information systems, and fraud and forensic accounting. Learners can also take business courses that cover economic theory, marketing management, and the management of responsible behavior in organizations. Accounting students seeking specialization in a particular area may use additional credits to earn certification and pass the Certified Fraud Examiner, Certified Internal Auditor, and/or Certified Management Accountant exams. Before the program begins, students may attend an optional orientation on UM's Coral Gables campus, during which they can meet faculty, network, learn about UOnline's learning model, and meet program alumni. Enrollees can complete the online master's in accounting program in 16 months. Coursework is taught asynchronously. Learners in the online MPA program pay the same tuition, regardless of where they live. Admission requirements include a bachelor's degree, school transcripts, and GMAT scores, although some students can have test score requirements waived. Miami is regionally accredited from the Southern Association of Colleges and Schools Commission on Colleges (SACSCOC). The online MPA program is fully accredited by the Association to Advance Collegiate Schools of Business (AACSB). Towson University ranks #12 on The 30 Best Online Master's in Accounting Programs! Towson, located in Maryland, offers students many of the academic programs found at bigger colleges. The school's strong business partnerships throughout the District of Columbia region benefit learners by providing opportunities for internships, research, and employment. The school's master of science in accounting and business advisory services program provides learners with the credentials necessary for career advancement and CPA certification. The program, offered fully online in partnership with the University of Baltimore, covers tax policy, taxation of entities, assurance services, and accounting systems. Additionally, a sustainability accounting course delves into how companies identify, measure, and report an entity's impact on the environment; the class evaluates trading, sustainability investing, and greenhouse gas emission. Learners can hone their research skills by taking an optional course where they engage in supervised research in select accounting areas. Individuals also complete an internship, working on assigned projects in an accounting environment. Faculty expect interns to develop a research paper and write a journal chronicling their work experience. The program's curriculum meets the 150-hour requirement for CPA certification in Maryland and other states. Admission into the master's in accounting online program requires a bachelor's degree in accounting with a minimum 3.0 GPA. Applicants should also submit school transcripts and GMAT or GRE scores. Students without a bachelor's in accounting must complete certain prerequisites prior to admission. Towson is regionally accredited from the Middle States Commission on Higher Education (MSCHE). The online MS in accounting and business advisory services program is fully accredited by the Association to Advance Collegiate Schools of Business (AACSB). Indiana Wesleyan University ranks #13 on The 30 Best Online Master's in Accounting Programs! IWU, an evangelical Christian college, was founded in 1985 and gives nontraditional students a variety of flexible learning options. Many of the school's more than 90 programs use online or hybrid delivery, and more than 8,000 IWU students opt to take classes through eLearning. IWU's business school offers faith-based business degrees that cultivate leaders with Christian character. The online curriculum of the 30-credit master of science in accounting program emphasizes forensic accounting, tax preparation, and the use of accounting standards and practices to conduct financial reporting. The program's cohort model provides participants with a high level of support and many opportunities for networking. The online accounting master's curriculum includes topics on ethics and business law, advanced auditing, tax theory and research, and government and nonprofit accounting. Students also learn how to create guidelines that address the legal implications of business transactions, develop effective communication strategies to achieve an organization's goals, and use a biblical framework to inform their work. Students must maintain a minimum 3.0 GPA to earn their degree. Learners pay one tuition rate, regardless of their residency status. Students can enroll at several points throughout the year, and most complete the degree in 18-26 months. Admission requirements include a bachelor's degree with a minimum 2.5 GPA, school transcripts, and accounting prerequisites, for some students. IWU is regionally accredited from the Higher Learning Commission (HLC). Pennsylvania State University-World Campus ranks #13 on The 30 Best Online Master's in Accounting Programs! Pennsylvania State University embraces online learning through its World Campus, which is the institution's virtual arm. The World Campus offers approximately 150 degree programs and certificates. Students pursuing business degrees can enroll in Penn State's 30-credit master of professional accounting. Graduates of this program become proficient in complex accounting methods and auditing approaches. This online master of accounting track also fulfills the education requirements necessary to sit for CPA licensure in Pennsylvania and other states. Areas of study include auditing theory and practices, business tax planning, financial statement analysis, financial reporting, and governmental and nonprofit accounting. Students also complete a capstone course, which examines the investigative accounting and litigation support activities that occur during forensic accounting. Learners in this online master of professional accounting program all pay the same tuition rate, regardless of their state of residency. Students without a bachelor's degree in accounting must take prerequisite courses to be eligible for admission. Penn State also offers a graduate certificate in accounting; this four-course program provides a different pathway towards a master's degree. All applicants must submit their undergraduate transcripts and GMAT or GRE scores. Penn State is regionally accredited from the Middle States Commission on Higher Education. The master of professional accounting program is accredited by the Association to Advance Collegiate Schools of Business (AACSB). Bentley University ranks #14 on The 30 Best Online Master's in Accounting Programs! One of the nation's top business schools, Bentley specializes in creating business leaders with technical expertise, a global perspective, and ethical standards. Students can learn on the main campus in Waltham, Massachusetts, or online through the school's virtual platform. Bentley's curriculum integrates business competencies with a liberal arts education. The school offers a master of science in accounting program that prepares graduates for the CPA exam. MSA students take 10-13 courses, including foundational study that covers financial accounting, cost accounting, managerial statistics, and financial statement analysis for decision making. Students pursuing their online master's in accounting also take a core that examines financial statement auditing, federal income taxation, and business processes and systems assessment. A suite of electives includes an internship option where students apply learned concepts in a practical context. Faculty require interns to write a research paper that addresses an accounting issue and highlights their work experience. Many full-time students complete the program in 12 months, and 89% of graduates secure employment within three months of earning their degrees. Bentley's career services help students accomplish career goals through self-assessment, marketing, and networking. Admission requirements include a bachelor's degree and GRE or GMAT scores. The program accepts new students in the spring and fall. Bentley is regionally accredited from the Association of New England Schools and Colleges (NEASC). The online MSA program is accredited by the Association to Advance Collegiate Schools of Business (AACSB). George Mason University ranks #15 on The 30 Best Online Master's in Accounting Programs! George Mason serves as Virginia's largest public research college. The school operates campuses in Arlington, Fairfax, and Prince William counties. Approximately 34,000 students attend GMU, which administers programs through 10 schools and colleges. The school's online master of science in accounting program cultivates ethical and proficient business professionals who can pursue CPA licensure in Virginia. MSA students complete a curriculum that integrates data analytics, research analysis, and advanced Excel skills. Coursework in the master's in accounting online program examines subjects such as financial accounting, fraud examination, and information technology auditing. Students choose one of four MSA tracks in tax, financial, forensic, or government accounting. A field experience allows students to complete a semester-long internship in public accounting or within a local industry. The program's signature global residency program also lets students earn international experience. This required experience takes individuals overseas for one week, during which they visit top accounting firms, meet with business and government leaders, participate in seminars, and network with faculty and MSA peers from other colleges. The program receives input from an accounting advisory council made up of executives from the Big Four accounting firms, the federal government, and other firms. Full-time students can earn their degree in one year, while part-timers typically graduate in fewer than two years. Admission requirements include a bachelor's degree in accounting and completion of prerequisite coursework. George Mason is regionally accredited from the Commission on Colleges of the Southern Association of Colleges and Schools (SACSCOC). The online MSA program is accredited by the Association to Advance Collegiate Schools of Business (AACSB). Nova Southeastern University ranks among The 30 Best Online Master's in Accounting Programs! NSU, located in Fort Lauderdale, Florida, offers students a comprehensive catalog of degree programs. The school hosts graduate programs in the business field and other disciplines. Students can pursue distance learning options at one of several regional campuses or online. The school's hybrid master of accounting program trains accountants to guide organizations in today's dynamic economic climate. The 39-credit curriculum serves those entering the accounting profession and experienced accounting professionals seeking to advance in their careers. The program also prepares learners to sit for the CPA exam. Students earning their master's degree in accounting online study financial statement analysis, advanced issues in auditing, and accounting information and control systems. Elective coursework allows learners to investigate additional areas, such as tax policy, forensic accounting, controllership, and real estate taxation. Two courses in business law expose students to the major legal requirements relevant to accounting. Topics covered include contracts, the Uniform Commercial Code, and the legal liability of accountants. Students also undertake an internship. Learners who take classes on weeknights and weekends on campus, in addition to online courses, can complete the program in 21 months. Students can begin classes in August, January, or May. Admission requirements include a bachelor's degree with a minimum 3.0 GPA, completion of foundational courses, and GMAT or GRE scores. Students without a background in accounting can complete foundation courses online. The University of Texas at Dallas ranks among The 30 Best Online Master's in Accounting Programs! Established as a research institution, UT Dallas hosts top-ranked programming in engineering, science, and math. The school also administers one of the best business programs in the state through its management school. Students pursuing an advanced accounting degree can complete the 36-credit master of science in accounting program completely online, and most distance learners graduate in 18-24 months. The curriculum examines topics such as financial accounting, tax fundamentals, and ethics for professional accountants. Students in the online master's in accounting program can use electives to customize their degree plan in areas that include taxation, assurance services, corporate accounting, and ERP/SAP systems. Students planning to take the CPA exam must complete 15 credits of accounting courses on campus, per the requirements of the Texas State Board of Public Accountancy. A fast-track option allows students to earn a baccalaureate degree and an MSA in an accelerated time frame. The school of management gives students exposure to best practices, internships, and research experiences at several of its constituent institutes. These include the Center for Internal Auditing Excellence, International Accounting Development: Oil and Gas, and the Center for International Risk and Analysis. Admission to the MSA program requires a bachelor's degree in accounting with a minimum 3.0 GPA. Applicants should also submit their GMAT or GRE scores. UT Dallas is regionally accredited from the the Southern Association of Colleges and Schools Commission on Colleges (SACSCOC). The online MSA program is accredited by the Association to Advance Collegiate Schools of Business (AACSB). Liberty University ranks among The 30 Best Online Master's in Accounting Programs! Liberty, an evangelical school, provides its student body with a liberal arts education steeped in Christian values. Through 17 schools and colleges, Virginia's LU administers more than 550 programs. LU also offers a full complement of online degrees and support services. The fully-online master of science in accounting program produces accountants who have industry-specific skills and business expertise. The 30-credit MSA also provides learners with the education requirements necessary to sit for the CPA exam. Students take core courses in advanced auditing, business law for accountants, accounting information systems, tax research jurisprudence, and financial accounting theory. The online master of accounting program offers several cognates, each with a series of courses that confer specializations. Cognates include taxation, audit and financial accounting, forensic accounting, and financial services. A leadership cognate trains learners to apply accounting theories and models from a leadership perspective with courses such as servant leadership, leadership theory, and accounting ethics. LU's support services include an online writing center, offered in partnership with tutor.com, and an online student life program, which provides a forum and supportive community. Admission to this program requires a bachelor's degree earned with a minimum 3.0 GPA. Liberty is regionally accredited from the Southern Association of Colleges and Schools Commission on Colleges. The online MSA program is accredited by the Accreditation Council for Business Schools and Programs (ACBSP). Seton Hall University ranks among The 30 Best Online Master's in Accounting Programs! Seton Hall is a Catholic school that enrolls approximately 10,000 students through 90 majors, both on its main campus in South Orange, New Jersey, and through its online learning options. Seton Hall's graduate programs in business build learners' professional skills and offer networking opportunities with top organizations and companies. Its school of business administers an online master of science in accounting, which develops students' technical proficiency in accounting and prepares them for the CPA exam. The 30-credit program enrolls students with degrees in accounting as well as those with degrees in other disciplines. The program's required courses cover financial reporting, auditing standards and problems, the essentials of federal taxation, commercial law, and a financial accounting seminar. A suite of electives allows students to customize their degree by focusing on topics that include taxation, financial accounting, and ERP systems. Learners can work with a career expert to help them identify job opportunities, and recruiters from the Big Four accounting firms and other organizations routinely recruit students enrolled in Seton Hall's master's in accounting online program. Full-time learners can complete the curriculum in 18 months. Admission into this program requires a bachelor's degree earned with a minimum 3.0 GPA, prerequisite accounting courses, and GMAT or GRE scores. Seton Hall is regionally accredited from the Higher Learning Commission (HLC). The online MSA program is accredited by the Association to Advance Collegiate Schools of Business (AACSB). Sacred Heart University ranks among The 30 Best Online Master's in Accounting Programs! Located in Fairfield, Connecticut, Sacred Heart provides more than 8,500 students with a Catholic education each year. SHU houses several schools and colleges, including a business college. Business students seeking to specialize in accounting can choose its 30-credit master of science in accounting, which focuses on complex financial transactions and strategic decision making. This hybrid accounting master's program also prepares learners for the CPA exam. Students take classes online and attend monthly Saturday seminars on campus where they learn from faculty and consultants who work in the field. Required courses include federal taxation, financial statement analysis, and financial accounting theory and practice. Students take a concentration in either forensic accounting or international accounting. Full-time learners can complete the program in one year. The school also offers a five-year option that allows aspiring accountants to combine a bachelor's in accounting with an MSA by completing a 150-credit program in an accelerated time frame. The campus offers academic enrichment activities, including leadership workshops and programs. Admission requirements include a bachelor's degree in a business earned with a minimum 3.2 GPA. Applicants should also submit their GMAT scores. Sacred Heart is regionally accredited from the New England Association of Schools and Colleges (NEASC). The online MSA program is fully accredited by the Association to Advance Collegiate Schools of Business (AACSB). University of Scranton ranks among The 30 Best Online Master's in Accounting Programs! Students at Scranton receive a liberal arts education in the Jesuit tradition. The private school seeks to transform students through scholarship and spirituality on its campus in Pennsylvania and through many distance learning options. The school's online master of accountancy cultivates ethical leaders with practical accounting expertise. The 30-credit core curriculum includes foundational courses in managerial economics, accounting ethics, and effective accounting communication. Learners also take four advanced elective courses to study specific areas, such as international accounting, occupational fraud and abuse, financial reporting and research, and advanced taxation and regulation. An eight-week, online capstone experience develops students' auditing, accounting, and tax research skills, teaching them how to solve challenges faced by accountants and financial managers. Learners in the online master's in accounting program prepare for the CPA exam by studying Wiley CPAexcel. Individuals with a non-accounting bachelor's degree must complete the 12-credit accounting bridge option. Learners can earn their degree with 10 months of full-time study or 20 months of part-time study. Admission requirements include a bachelor's degree, GMAT or GRE scores, and at least three years of relevant professional work experience. Scranton is regionally accredited from the Middle States Commission on Higher Education (MSCHE). The online MAcc program is fully accredited by the Association to Advance Collegiate Schools of Business (AACSB). Auburn University ranks among The 30 Best Online Master's in Accounting Programs! Established in 1856, Auburn enrolls approximately 25,000 students. The university, located in central Alabama, offers more than 140 majors administered by 13 colleges and schools. Auburn's college of business delivers a suite of graduate degrees, including a master of accounting, which has been offered online since 2000. Designed for working professionals, students in the 30-credit program learn technical competencies related to the profession, develop an aptitude for research, and prepare for the CPA exam. Required courses include research in accounting, federal tax research, advanced auditing and assurance services, and integrated accounting applications. Students use electives to pursue additional education in different areas of accounting, such as advanced business law, fraud examination, real estate finance, financial analysis and valuation, and government and nonprofit accounting. Students must attend a three-day, on-campus residency in their final spring semester, during which they participate in the Auburn MAcc Leadership Summit. This summit provides enrichment activities, such as leadership workshops, business seminars, and social events. Distance learners can complete the master's in accounting online program with two years of part-time study. Students who enroll full-time can earn a degree in one year. Learners pay the same tuition, regardless of their state of residency. Admission requirements include a bachelor's degree, GMAT scores, and requisite business and accounting foundation coursework. Auburn is regionally accredited from the Southern Association of Colleges and Schools Commission on Colleges. The online MAcc program is fully accredited by the Association to Advance Collegiate Schools of Business (AACSB). SUNY Polytechnic Institute ranks among The 30 Best Online Master's in Accounting Programs! Best known for its science and technology offerings, SUNY Poly also educates business and management professionals. SUNY Poly works with students at its campuses in Utica and Albany in Upstate New York and through distance learning programming. Online programs include the master of science in accountancy, a 33-credit program that is available in a part-time or full-time format. Completion of the online master's in accounting track qualifies students to sit for New York state's CPA and Certified Management Accountant exams. Students take the program exclusively online, delving into an accounting core that covers income tax research, fund accounting, and financial statement analysis and reporting. The program also gives students business expertise through courses in financial management problems, quantitative business analysis, multinational economics of technology, and management information systems. A seminar in accounting and finance teaches students about global capital markets, requiring them to use investment analysis and accounting tools to value assets. A forensic accounting and valuation specialization offers a set of electives that prepare learners for one of the fastest growing areas in accounting. Students study topics that include forensic asset valuation, fraud detection and prevention, and specialized accounting data analytics. Admission requirements include a bachelor's degree in accounting and GMAT scores. SUNY Poly is regionally accredited from the Middle States Commission on Higher Education (MSCHE). The online MSA program is fully accredited by the Association to Advance Collegiate Schools of Business (AACSB). Tennessee Technological University ranks among The 30 Best Online Master's in Accounting Programs! Students at Tennessee Tech receive a top education through the academic programs administered by the eight schools and colleges. The university's college of business provides distance learners with degree options in business administration and accounting. Tennessee Tech delivers its 30-credit master of accountancy program through one-year and two-year tracks with limited face-to-face requirements. The hybrid program cultivates advanced accounting knowledge and professional skills, preparing students for the CPA exam. Learners study a core that examines tax management and entities, auditing and attestation, tax research and strategy, and ethics and a professional code. A series of courses cover topics in all four sections of the CPA exam. Students take two electives to finish off the credit requirements for this online master's in accounting, exploring subjects such as financial management, organizational leadership, employee relations, and data resource management. Learners who want to examine business and accounting in a global context have the option to pursue international business, international economics, and multinational finance electives. During the program's two required residencies, students engage in group work, presentations and seminars, and network with faculty and peers on the school's campus. Distance learners at Tennessee Tech pay the same rate, regardless of their state of residency. Admission requirements include a bachelor's degree in accounting with a minimum 3.0 GPA. Applicants must also submit school transcripts and GRE or GMAT scores. Tennessee Tech University is regionally accredited from the Southern Association of Colleges and Schools Commission on Colleges (SACSCOC). The online MAcc program is fully accredited by the Association to Advance Collegiate Schools of Business (AACSB). 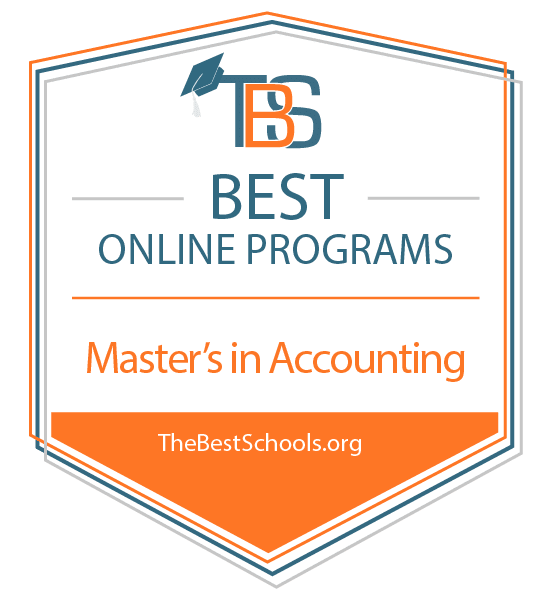 University of Alabama at Birmingham ranks among The 30 Best Online Master's in Accounting Programs! UAB is the state's top employer and oversees one of the largest academic health centers in the nation. The school's comprehensive catalog includes programs administered by its business school, which emphasizes hands-on experiences through internships and other applied learning opportunities. Students can pursue many of the business school's programs in a hybrid format or completely online. Accounting professionals and those new to the field can enroll in the 30-credit master of accounting track. The online accounting master's program boosts students' competencies in accounting, applied research, and technology usage. The curriculum prepares students for a variety of professional certifications, including the CPA exam. Learners take 21 credits of required courses in financial accounting, tax entities, corporate governance, business law for accountants, advanced taxation and attestation, and governmental and nonprofit accounting. An accounting bridge program offers students without an accounting degree the opportunity to earn the prerequisites needed to pursue an MAcc. The business school allows students to transfer some credits into the program. Learners can earn their degrees in five semesters. Applicants must submit GMAT scores. UAB is regionally accredited from the Southern Association of Colleges and Schools Commission on Colleges (SACSCOC). The online MAcc program is fully accredited by the Association to Advance Collegiate Schools of Business (AACSB). DePaul University ranks among The 30 Best Online Master's in Accounting Programs! Founded in 1898, DePaul remains the nation's largest Catholic college and one of the top ranked Midwestern postsecondary institutions in the U.S. With more than 300 degree programs, the school administers a large suite of majors at its two campuses in Chicago and online. Accounting students can complete the curriculum for the master of science in accountancy program online in an asynchronous format. Learners cover theoretical accounting concepts and their practical application. Students prepare for the CPA examination with courses that cover all four sections of the exam. Distance learners in the online master's in accounting program also learn about financial accounting, cost and managerial accounting, and tax treatment of corporations and partnerships. Other business-related topics include macroeconomics, financial management, and operations management. DePaul requires MSA students who lack a business background to take additional business courses. Learners with a background in business and/or accounting can have some courses waived, allowing them to complete the program in 18 months. The program offers multiple start dates throughout the year. Admission requirements include a bachelor's degree, but applicants do not need to submit GMAT or GRE scores. DePaul is regionally accredited from the Higher Learning Commission. The online MSA program is fully accredited by the Association to Advance Collegiate Schools of Business (AACSB). Maryville University of Saint Louis ranks among The 30 Best Online Master's in Accounting Programs! Situated on a 130-acre campus in Missouri, Maryville enrolls more than 8,000 students through 90 academic programs. The majority of Maryville's graduate students earn their degrees through eLearning options. The university's school of business works with companies in the region to develop programs in areas such as business administration and accounting. Partnerships with business organizations, which includes Fortune 500 companies, provide students with internship opportunities. Students can enroll in the university's 30-credit master of science in accounting, which is delivered online with no residency requirements. The program prepares accountants versed in tax preparation, auditing, and the elimination of waste and fraud. The core curriculum delves into financial reporting, data analytics, tax planning and decision making, and accounting research and communications. Students use Becker Certified Public Accounting prep courses to study for the CPA exam. Learners with no accounting background use a bridge program to complete prerequisite courses before pursuing their master's degree in accounting online. Students can begin taking classes in the fall, spring, or summer. Online learners enjoy small class sizes that allow for personalized learning, and distance learners can complete the program in 10 months. Admission requirements include a bachelor's degree earned with a minimum 3.0 GPA. Applicants should submit their school transcripts, but they do not need to complete the GRE or GMAT. Maryville is regionally accredited from the Higher Learning Commission (HLC). Georgia Southern University ranks among The 30 Best Online Master's in Accounting Programs! Georgia Southern serves 27,000 students, both online and at its campuses in Savannah, Hinesville, and Statesboro. The school offers an academic catalog of 142 degrees. Georgia Southern's college of business administration has the school's second largest enrollment and delivers three graduate degrees completely online, including its 30-credit master of accounting. The two-year program allows working professionals to earn their degree while remaining employed. To graduate on time, learners must take two courses each fall and spring term and one summer course. Faculty deliver the program through a cohort model to maximize team learning. The core of this online accounting master's program focuses on audits, tax research, financial accounting, and fraudulent financial reporting. Upon completion of the program, students can analyze financial and accounting data, follow professional ethics related to the accounting discipline, and understand accounting implications in a global economy. The college of business' partnerships with accounting firms facilitate internship opportunities for students. Additional extracurricular activities include membership in professional organizations, such as Beta Alpha Psi and the Accounting Association, both of which strengthen students' leadership skills and provide networking opportunities. Admission requirements include a bachelor's degree in accounting, school transcripts, and GMAT scores. Applicants without an accounting degree must satisfy certain prerequisites. Georgia Southern is regionally accredited from the Southern Association of Colleges and Schools Commission on Colleges (SACSCOC). The MAcc program is fully accredited by the Association to Advance Collegiate Schools of Business (AACSB). The University of West Florida ranks among The 30 Best Online Master's in Accounting Programs! With a main campus in Pensacola, UWF enrolls approximately 13,000 students who select from several majors administered by the school's five colleges. Among these offerings is a fully-online master of business administration program, which features three specializations, including accounting. Students in the 36-credit MBA program with an emphasis in accounting take business and accounting courses that boost financial, leadership, and teamwork skills. The program also prepares learners to sit for the CPA exam. The accounting program ranks highest in Florida with a first-time pass rate of 87% on the CPA test. Students study business courses, such as business analytics, financial management, advanced managerial economics, and management and organizational behavior. The accounting specialization is comprised of coursework in financial accounting, corporate tax, advanced auditing, and managerial accounting. The program offers multiple start dates throughout the year, and students can earn their degrees in 16 months. All enrollees in this online master's in accounting program pay the same tuition, regardless of where they live. Admission requirements include a bachelor's degree earned with a minimum 3.0 GPA, although applicants with at least eight years of work experience can apply with a minimum GPA of 2.75. Students must also submit their GRE or GMAT scores. UWF is regionally accredited from the Southern Association of Colleges and Schools Commission on Colleges (SACSCOC). Every online accounting master's program is different, and course offerings tend to vary from school to school. Certain courses are integral to the core curriculum for most online master of accounting programs, including some of the following classes. Auditing: This class addresses basic concepts related to internal and external auditing, such as internal control, evidence collection, and ethical standards. Learners may be required to evaluate case studies and apply standards and procedures to audit situations in the public and private sectors. Fraud examination: Covering common types of financial fraud, such as concealment and employee embezzlement, this course introduces methods of identifying and investigating corporate dishonesty. Prospective forensic accountants develop practical fraud detection and prevention skills, along with a working knowledge of reporting and relevant legal procedures. Accounting research: Utilizing real case studies and current research sources and methodologies, this course builds graduate-level analytical and research skills. Students examine complex financial problems using fundamental accounting theories and professional standards, as well as alternative reporting methods. Advanced financial accounting: Building on foundational accounting theories and concepts, this class introduces complex issues related to finance. Topics covered include consolidations, partnership accounting, segment reporting, and equity accounts, as well as matters related to specialized fields such as sustainability accounting and business management. Government accounting: Coursework explores financial issues related to government and nonprofit organizations, including budget reporting, program analysis, and tax levies. Students learn to prepare financial statements according to Governmental Accounting Standards Board regulations and perform government audits in compliance with national standards. Certified Public Accountant (CPA): Accountants who receive this certification qualify to perform a broad range of functions. CPAs may provide public accounting services, write government-sanctioned audit reports, represent clients before the IRS, and prepare taxes. Prospective CPAs must have at least one year of relevant work experience before seeking licensure. Chartered Financial Analyst (CFA): Known as the gold standard of financial certifications, this designation is awarded to individuals who complete the CFA educational program and pass a three-part exam. Topics include portfolio investments, inputs, and financial analysis. Candidates must have at least a bachelor's degree and four years of professional experience in finance or investing. An online master's in accounting degree provides graduates with the knowledge and skills needed to work in several capacities throughout the financial sector. While many students go on to become treasurers, auditors, or budget analysts, others work in law enforcement as forensic accountants. The positions listed below rank among the most popular with graduates. Accountant: In addition to preparing and assessing clients' financial records, accountants maintain financial operations, oversee and inspect accounting systems, and complete tax returns. While most entry-level accounting positions require only a bachelor's degree, many employers prefer to hire candidates with a graduate degree. Financial Manager: A financial manager's duties depend largely on their setting and industry; most focus on data analysis and cost reduction, while other professionals also prepare budgets, monitor cash flow, assess financial risks, and/or direct mergers and acquisitions. Employers typically prefer candidates with a graduate degree and industry certification. Human Resource Manager: Human resource managers oversee all of the administrative functions of an organization, including hiring, benefits plan development, and other staffing issues. These workers serve as a liaison between an organization and its employees. Along with a master's degree, candidates for many high-level human resource management positions must have extensive work experience in a related field. When choosing an online master's program, it is important to pursue a degree from an accredited institution. All accredited schools have been assessed according to quality control guidelines set by accrediting bodies. Regional accreditation is more common than national accreditation and is typically bestowed on public nonprofit universities. Credits earned at a regionally accredited school tend to transfer more easily between institutions. Alternatively, national accreditation is usually granted to for-profit vocational schools. Many regionally accredited schools do not accept accept transfer credits from institutions that only hold national accreditation. In addition to regional or national designations, some accounting programs receive field-specific accreditation from organizations such as the Association to Advance Collegiate Schools of Business (AACSB), the International Assembly for Collegiate Business Education (IACBE), or the Accreditation Council for Business Schools and Programs (ACBSP). These accrediting bodies assess postsecondary business programs according to industry-specific criteria. Students currently pursuing a master's in accounting online, as well as recent graduates, should consider joining professional organizations to receive professional support and guidance. In addition to exclusive job boards, career services, and networking opportunities, organization members can access a variety of educational resources. Certification courses and continuing education programs provide resume-boosting credentials, and many professional associations host digital research databases. The list below contains a few organizations pertinent to professional and aspiring accountants. American Accounting Association: The American Accounting Association seeks to advance scholarly research in the field. Along with educational resources and exclusive webinars, AAA members have access to the organization's extensive digital library. National Society of Accountants: Promoting professional excellence through certification and legal advocacy, this society offers its members resources that include insurance plans, tax preparation tools, and continuing education opportunities. Association of International Certified Professional Accountants: Setting quality standards for CPAs in the U.S. and abroad, the AICPA has more than 418,000 members worldwide. Its Young CPA Network provides students with support, career assistance, and networking opportunities.